We’re going to take a walk on the wild side with today’s epic jungle safari party so keep your eyes peeled. If you’re expecting the usual jungle mayhem then think again because this is PDM and you know how we love to give our readers the unexpected twist. After all, variety is the spice of life. Giving this classic theme a bit of glitz, a dash of pizzazz and a whole dose of gorgeousness, this is one party that certainly went off the scale with its own brand of chicness. What do you say we grab a pair of binoculars and off we go to another exciting journey. From the colors and patterns to all the things in between, Khim of Party Deco gave us another standing ovation-worthy bash. I love how everything looks posh and oozing with prettiness. The whole setup and desserts are sure to impress! 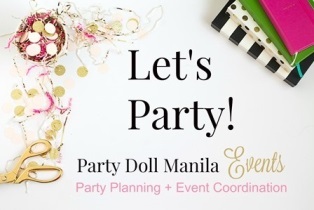 Khim sure knows how to take kiddie parties to the next level and I think she has outdone herself once again with Danielle’s party! To make it more interesting, they also injected a second theme which is ‘arts’. So yeah, I’m pretty much in cloud nine when I was scanning through the images because every area of Danielle’s party is simply spectacular. Wondering how they pulled it off? Better scroll down to see the full set. Giving the party the perfect girly ambiance, they chose the sweet hues of pastel for their décor. Using paper lanterns, honeycomb lanterns and animal silhouette details as ceiling embellishment created a very charming effect. The use of those ribbon chandeliers added a feminine touch and texture making the venue extra fab. Their stage setup looks pretty impressive, eh? The use of those 3D gold animals made the set look elegant yet fun at the same time. From the colors used to the pretty ‘Danielle’ lettering used at the background, the whole installation looks girly and refreshing. Using the same elements as their stage setup, their table arrangement looks equally beautiful to say the least. With golden animal porcelain and fresh flowers looking glamorous as centerpieces, don’t miss out those pastel painted leaves at the back! Even their place mats look so adorable. Personalized water bottles and artist Danielle’s palette board fans were placed at the kiddie tables. Danielle’s geometric jungle safari-inspired cake is all sorts of pretty. The chic color combination, geometric patterns and animal silhouette fondant toppers made Danielle’s cake perfect for this delightful fete. An exquisite dessert tablescape always make my heart melt. With the pairing of two unlikely party themes together, it’s amazing how they flawlessly incorporated these themes harmoniously in their dessert spread. The table was filled with visually appealing desserts that were both inspired by the jungle and arts together! Check out Danielle’s paints with brush cookies, framed animals sugar cookies, geometric patterned cookies and mini ombre cakes, each and every one of them was awesomely made and presented. Their kiddie guests were in for a real treat as several arts and crafts station were prepared for them to enjoy. I’m sure every kid had a blast unleashing their creativity with fun activities such as art dough, cupcake creation, doodle fun and safari painting masterpiece.